A reclaimed, cast iron, freestanding fire basket. The basket has spiked finials and spiked style feet. The firebasket has been blacked and polished giving a nice colour and finish. The item is reclaimed and therefore has some signs of use and wear. There are some slight patches of surface rust and some tarnish to the grill. The underside has some surface rust. Some small knocks and chips as expected of reclaimed items. 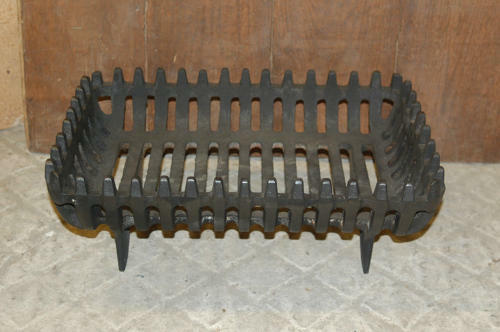 A simple, classic, firebasket that would add great style to a hearth. The basket is of a nice, petite, size and therefore would be perfect for a bedroom or smaller reception room.